"Discover Within the Pages Of This Report:"
Your business isn't making any decent income just yet and you feel that something is wrong and that you ought to correct it as soon as possible. WAIT! 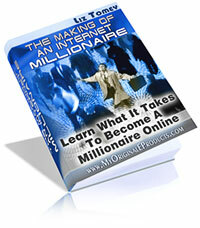 Special offer: Would you like to have resale rights to the "Making Of An Internet Millionaire" ebook? You'll be able to sell the "Making Of An Internet Millionaire" ebook to your customers and keep 100 of the profits. Your resale rights come with a complete website salesletter, and professional graphics for you to promote the "Making Of An Internet Millionaire" ebook with.